Ruby Goodwin, 91, of Apex, died Friday, January 12, 2018 at Person Memorial Hospital in Roxboro, NC. Ruby was born on May 2, 1926 in Wake County, NC to the late Thomas Alvis Goodwin and Dorsey Viola Canady Goodwin. She was a graduate of Apex High School and was employed with the Dorchester Waylyn Baptist Church kindergarten and later with the Charleston County SC school district. Ruby was a member of Olive Chapel Baptist Church. 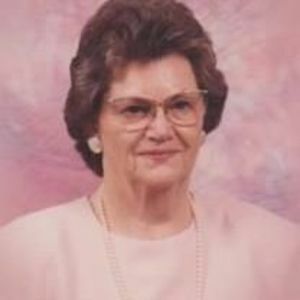 In addition to her parents, she was preceded in death by her husband, Wallace Warren Goodwin and siblings, Buna Lasater, Leamon Goodwin, and Leroy Goodwin, and daughter-in-law, Fay Goodwin. Ruby is survived by her son, Thomas Edward Goodwin of Timberlake, NC and her daughter, Deborah Ann Rountree of Apex; and her grandchildren, Warren Goodwin (Julie) of Timberlake, NC, David Rountree (Amber) of Seattle, WA, Jessie Rountree (Stephen) of San Rafael, CA, Sarah Rountree of Los Angeles, CA; her great grandchildren, Katie and Thomas Goodwin of Timberlake, NC. A funeral service will be held 3pm Monday, January 15, 2018 at Olive Chapel Baptist Church, 600 New Hill Olive Chapel Rd, Apex, NC 27502. Burial will follow the service in the church cemetery. The family will receive friends 2-3pm prior to the service at the church. Memorials may be made to Olive Chapel Baptist Church.